Though a generation has passed since the massacre of civilians at My Lai, the legacy of this tragedy continues to reverberate throughout Vietnam and the rest of the world. This engrossing study considers how Vietnamese villagers in My Lai and Ha My—a village where South Korean troops committed an equally appalling, though less well-known, massacre of unarmed civilians—assimilate the catastrophe of these mass deaths into their everyday ritual life. 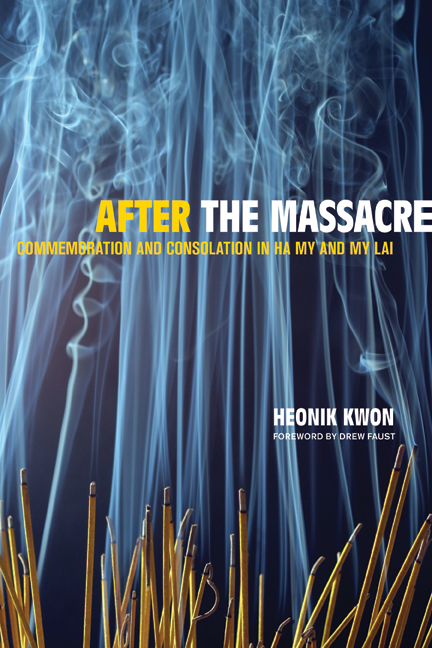 Based on a detailed study of local history and moral practices, After the Massacre focuses on the particular context of domestic life in which the Vietnamese villagers interact with their ancestors on one hand and the ghosts of tragic death on the other. Heonik Kwon explains what intimate ritual actions can tell us about the history of mass violence and the global bipolar politics that caused it. He highlights the aesthetics of Vietnamese commemorative rituals and the morality of their practical actions to liberate the spirits from their grievous history of death. The author brings these important practices into a critical dialogue with dominant sociological theories of death and symbolic transformation. Heonik Kwon is Lecturer in Social Anthropology at the University of Edinburgh. Drew Faust is Dean of the Radcliffe Institute and Lincoln Professor of History in the Faculty of Arts and Sciences at Harvard University.